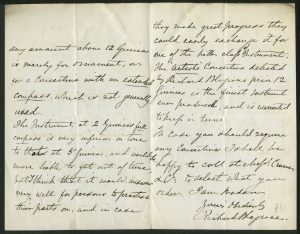 Among the holdings pertaining to the concertinist (and violist) Richard Blagrove (1826 – 1895) at the Museum of the Royal Academy of Music, there is an autograph letter dated 28 September 1863 from Blagrove to an unnamed female recipient. Housed in the Museum’s McCann Collection under the acquisition number 2004.1482, the letter (apparently the only known letter in Blagrove’s hand) provides insight into a number of aspects concerning Blagrove’s activities as a concertinist. Fig. 1. 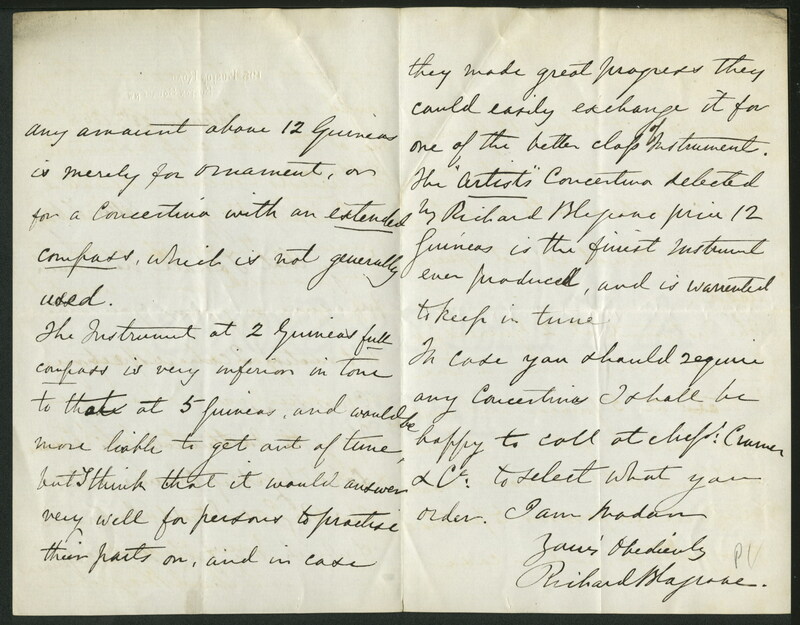 Richard Blagrove, letter of 28 September 1863 to an unnamed recipient; Royal Academy of Music, Museum, McCann Collection, 2004.1482. Images reproduced with permission from the Royal Academy of Music, London. Though Blagrove’s orthography presents no difficulties, I offer a transcription in which the added superscript letters serve as “cues” to the topics discussed below. In reply to your letter I beg / to say that I shall have much / pleasure in giving you any / information I can respecting / concertinas. The Instrument at 2 Guineas full / compass is very inferior in tone / to that at 5 Guineas, and would be / more liable to get out of tune, / but I think that it would answer / very well for persons to practise / their parts on, and in case / [page 3] they made great progress they / could easily exchange it for / one of the better class of Instruments. / The Artists Concertina selected / by Richard Blagrovef price 12 / Guineas is the finest Instrument / ever produced, and is warrented [sic] / to keep in tune. What follows takes up the seven passages cued above. Cramer & Co.: Founded in 1824 by the Mannheim-born composer and piano virtuoso Johann Baptist Cramer (1771 – 1858), the firm of Cramer & Co. flourished under various names (these reflecting changes in partnerships) throughout the Victorian era and beyond, and played a major role in three areas of English musical life: publishing, instrument sales, and piano manufacturing. Some words about Cramer personally and the firm are in order. Table 1. The various names under which and addresses at which “Cramer & Co.” operated, 1824 – 1895. Note: also known simply as Cramer & Co.; Cramer’s partners: Robert Addison (d. 1868) and Frederick Beale (?1804/05-1863); Addison left the firm in 1844, replaced by William Chappell (1809-1888). Note: also known as Cramer, Beale & Co.; Cramer died in 1858 (he had already left the firm some twenty years earlier); Chappell retired in 1861, at which time the firm came under the control of Frederick Beale, who brought in George Wood (?1812/13-1893). All of this raises an interesting question: why did Blagrove recommend Cramer & Co. in the first place, as opposed, say, to one of the leading manufacturers of concertinas, namely Wheatstone or Lachenal? Table 2. Number of entries on a year-by-year basis containing Richard Blagrove’s name in the Wheatstone ledgers, January 1839 – May 1870. Years indicated in italics are incomplete in the ledgers. The years 1849-1850 are missing entirely (see note 8), their place indicated by – – –. a Entries begin on April 30th. b Entries break off as of April 5th. c Entries break off as of May 23rd. Fig. 2. Lachenal price list in MDRA/1861; online at “Concertina Library,” http://www.concertina.com/pricelists/lachenal/Lachenal-MDRA-1861.pdf. Mr. R Blagrove [my emphasis], and other eminent professors. Yet despite these close connections to the Lachenals, it was to 210 Regent Street — not 8, Little James Street, Bedford Row (the site of Lachenal’s shop) — that Blagrove sent his correspondent. As for Cramer & Co.: at no time did any “version” (combination of partners) of that firm manufacture concertinas. Rather they bought instruments from Wheatstone and, no doubt, other manufacturers. Thus from 16 September 1844 through 11 February 1870, the Wheatstone ledgers record no fewer than fifty-one sales to Cramer & Co., with the sixteen sales in 1851 (just under one-third of the total) marking the most intense period of activity (see Appendix B). 13 And if they sometimes sold these instruments with the original labels of the manufacturers, we will see that they also relabeled them with oval badges that read “Cramer & Cos” (see §f below). Why, in the end, did Blagrove recommend Cramer & Co., which, under the name “Cramer, Wood & Co,” also published Blagrove’s Instruction Book for the Study of the Concertina in 1864? 14 One rather obvious answer is that, as a firm that sold instruments made by a number of manufacturers, Cramer & Co. offered the prospective buyer a wider choice of concertinas than did any single maker. Yet plausible as this is, I think there was another, somewhat less altruistic, reason: that Blagrove had recently(?) struck up a kind of “endorsement” deal with Cramer & Co., one that we will consider in §f, below. 210 Regent Street: Blagrove presents us with something of a conundrum. Although he clearly gives Cramer & Co.’s address as 210 Regent Street, Table 1 shows that the firm did not occupy that address until 1872, until which time they had long been settled at number 201 on that street (which address also appears — together with 209, which housed the Piano Gallery — on the title page of Blagrove’s contemporary Instruction Book). Did Blagrove merely err in connection with the last two numbers, or did Cramer & Co. have some kind of unofficial — and unadvertised — access to 210. And is it merely coincidence that when, for 1872, Parkinson lists 210 for the first time (see Table 1), 201 disappears from the list of addresses? In the end, I can shed no light on the matter. Wheatstone/1859 lists their 48-key instruments at from four to twelve guineas; concertinas in the two-guinea range are limited to those with only twenty-two or twenty-four keys (see note 7). Lachenal/1861 has bottom-of-the-line 48-key instruments for three guineas and then tops out at eight guineas for his “extra best [48-key treble . . . ] ornamented with silver touches”; tenor and baritone concertinas push the top of the range up to eleven guineas (see Fig. 2 and the bibliographical information given there). In all, Blagrove is pretty much on the mark. extended compass which is not generally used: By “extended compass” Blagrove refers to the treble concertina with fifty-six buttons, as opposed to the more customary 48-button instrument, which had become more or less standard by mid-century and which was usually referred to as an instrument with “full compass.” 18 Thus a treble concertina with an extended compass had a four-octave range that went from the low g (a 4th beneath middle C) up to g’’’’. 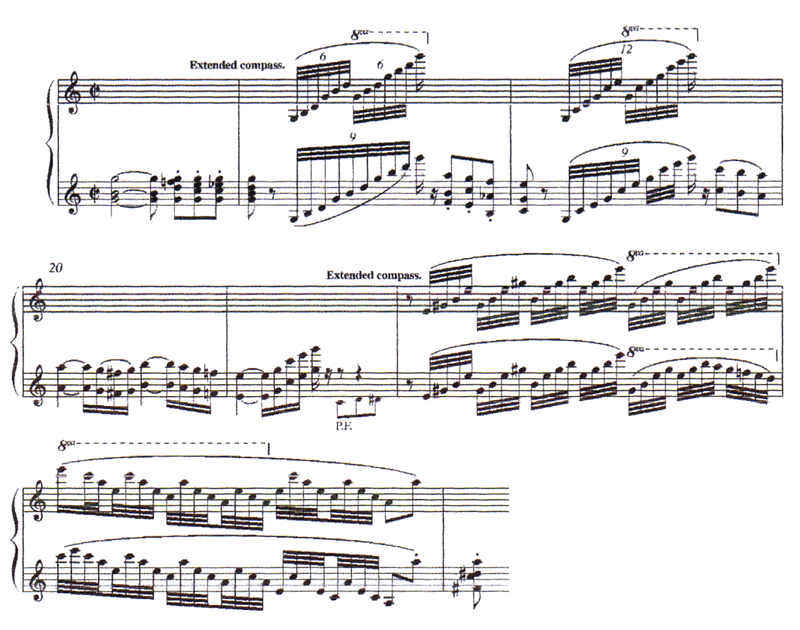 Though the 56-button instrument was only occasionally used at the time Blagrove wrote the letter, there are ossia (that is, alternate) passages for the extended compass in at least two of Blagrove’s later (one only slightly so) compositions: Souvenirs de Donizetti (1867) and Fantasia on National Airs (1886), both for treble concertina and piano. 19 Example 1 offers measures 103-104 and 133-137 of the Fantasia. (a) meas. 103-104, (b) meas. 133-137 (concertina part only). Ex. 2. George Roe, Recollections of Scotland: Fantasia Brilliante (London:Wheatstone, 1875, meas. 17-24 (concertina part only). And now, I think, we can understand why Blagrove was sending his “Dear Madam” to Cramer & Co. and praising that firm’s “Artist’s Concertina.” It would appear that he had entered into some kind of endorsement agreement with them, and that perhaps he even received a cut from every “Artist’s Concertina” sold. 26 Yet while this may well explain the seeming break with Wheatstone’s, we can only wonder why he did not strike such a deal with Lachenal, with whom, as we have seen, he apparently grew close circa 1860. Finally, Blagrove’s letter shows that Cramer & Co. was dealing with the Blagrove-endorsed “Artist’s Concertina” as early as 1863, a decade earlier than has been supposed. That Blagrove therefore expresses his willingness to go over to Cramer & Co. in order to fetch the concertina that the unnamed recipient of the letter might order is nothing at all out of the ordinary. Rather it was simply a service that “Professors of Concertina” seem to have provided. 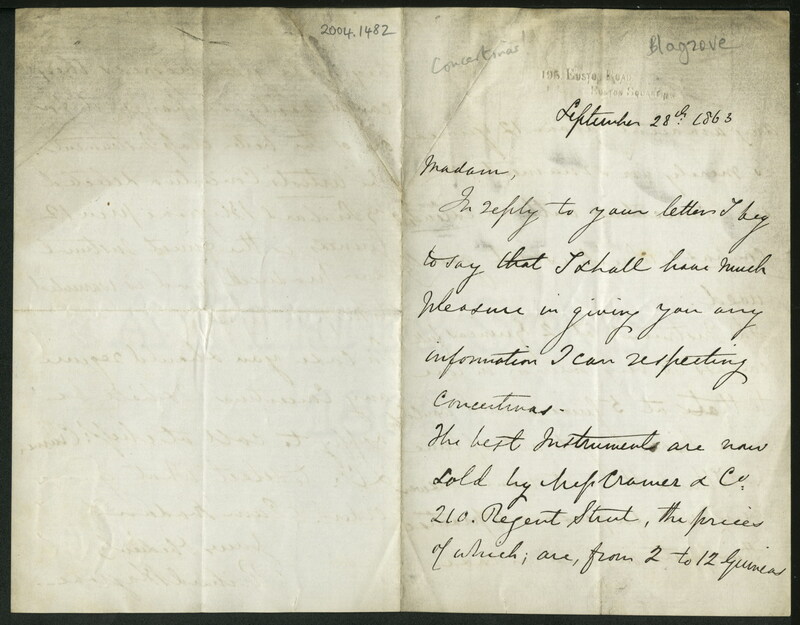 To conclude: our letter is important for a number of reasons: (1) it appears to be the only known letter written in Blagrove’s hand; (2) it shows that the Blagrove – Cramer & Co. – Artist’s Concertina connection was already in place by 1863 at the latest; (3) it sheds some light on the drastic decline in the number of Blagrove entries in the Wheatstone ledgers beginning in 1859; and (4) it confirms my earlier suggestion that the leading concertina teachers of the day were happy — or should we say obliged — to run around town in order to pick up instruments for their students (both current and prospective). As such, it adds to our knowledge of the mid-Victorian concertina world, both in general and as it pertains to Richard Blagrove in particular. What follows lists all 179 references to Richard Blagrove in the Wheatstone ledgers. With respect to the overlapping entries in C1046 (organized chronologically) and C104a (organized by serial number): when, as they sometimes do, they differ either partially or entirely, I provide both entries. Throughout the ledgers there are three types of entries that pertain to Blagrove without mentioning his name. Two of these are clear cut: a notated reference to Blagrove is followed either by “D[itt]o” or “Mr — —” (at no point have I reproduced the ledgers’ use of superscripts); I have passed over these silently. The third type is more problematical and perhaps even open to question: on six occasions an entry for Blagrove is followed by a blank space where a name should appear; I have counted these as referring to Blagrove, and I have noted their appearance in the Comments column. The ledgers’ utilize a number of abbreviations in recording their transactions, three of which appear in entries concerning Blagrove: “Ex” = “Exchanged”; “ret” = “returned”; and “SH” = “Second Hand.” Finally, although the ledgers begin to provide prices for the instruments as of 1 January 1851 (ledger C1047), I have not included them. N.B. : The final entry in C1046 is on 5 April 1848; the next ledger, C1047, begins on 1 January 1851; clearly, an entire ledger is missing (see note 8). Appendix B lists the fifty-one entries for Cramer & Co. in the Wheatstone ledgers. Though the company was known under various names depending upon the changing partnerships (see Table 1, above), the ledgers consistently use “Cramer & Co” or variants thereof (again, I have not reproduced the ledgers’ superscripts, and thus what some might judge to be the typographically awkward “Messrs.” As noted in Appendix A, the ledgers begin to include prices as of 1 January 1851 (in C1047); here I include them. If, as sometimes happens, a transaction fails to include either a serial number or, after 1 January 1851, a price, I indicate that with – – – -. Finally, when a price applies to more than one instrument, I note that in the Comments, enter the price in the space for the first instrument to which it applies, and leave the “price column” blank in the subsequent entries. 18 May 1060 (!) C1046, 46 serial number in pencil; does repetition of #1060 have to do with alteration in C1046 on 24 Jan? 1860 no entries for Cramer & Co.
1862 – 1865 no entries for Cramer & Co.
1868 – 1869 no entries for Cramer & Co.
My thanks to Dr. Barbara Diana, Special Collections Cataloguer at the Academy, for calling the letter to my attention and sending me a copy. Thanks also to Mr. Ian Brearey for processing my request for a high-resolution image both quickly and in painless fashion. Census Returns of England and Wales for the Year 1861 (London, 1861); online at Ancestry.com/1861 England census. By the time the 1871 census was taken, Blagrove, now married to Elizabeth Freeth and himself the father of three children, had moved to 108 Union Grove. It was Elizabeth who accompanied Blagrove at his 23 November 1868 recital at Windsor Castle; the program appears in Allan W. Atlas, The Wheatstone English Concertina in Victorian England (Oxford: Clarendon Press, 1996), plate 11. My thanks to Randall C. Merris for sharing with me scanned images of the census records. I draw upon Jerald Graue and Thomas Milligan, “Cramer: (2) Johann Baptist Cramer,” in The New Grove Dictionary of Music and Musicians, 2nd ed., Stanley Sadie and John Tyrell, eds. (London: Macmillan, 2001), vol. 6, 640-43; online at http://www.oxfordmusiconline.com/subscriber/article/grove/music/44589pg2. Our Cramer should not be conflated with the English-born manufacturer of wind instruments, John Cramer, who flourished in London from c. 1785 to 1828; see Anne Beetem Acker, “J.B. Cramer,” in The New Grove Dictionary of Musical Instruments, 2nd ed., Laurence Libin, ed. (New York: Oxford University Press, 2014), i, 70. For a catalogue of Cramer’s compositions, see Thomas B. Milligan, Johann Baptist Cramer (1771-1858): A Thematic Catalogue of his Works. Thematic Catalogue Series, 19 (Stuyvesant, NY: Pendragon Press, 1992). There is a generous selection of his music for solo piano in Nicholas Temperley, ed., The London Pianoforte School, vols. 9 – 11 (New York: Garland Publishing, 1984-1985). Although we will have occasion to question one aspect of Table 1 when we discuss Blagrove’s 1864 Instruction Book for the Study of the Concertina (see below and note 14), the table follows (precisely) John A. Parkinson, Victorian Music Publishers: An Annotated List (Warren, MI: Harmonie Park Press, 1990), 62-63; see also, Charles Humphries and William C. Smith, Music Publishing in the British Isles from the Beginning until the Middle of the Nineteenth Century, 2nd ed. (Oxford: Basil Blackwell, 1970), 120-21; Frank Kidson, British Music Publishers, Printers and Engravers: London, Provincial, Scottish, and Irish (London: W.E. Hill & Sons, 1900; reprint – New York: Benjamin Blom, 1967), 34-35. A ghost of the firm’s piano manufacturing lives on; in 1964, that part of the business was absorbed by Kemble & Co., which was in turn bought up by Yamaha in 1969; Cramer’s “ghosts” are now manufactured in Indonesia, intended mainly for distribution in Asia; see Acker, “J.B. Cramer,” 710. The entire sentence reads: “Concertinas, with full compass (48 Keys) from 4 to 12 Guineas, the latter as used by Signor Regondi and Mr. Richard Blagrove.” The price list appears in Musical Directory, Register and Almanac for 1859 (London: Rudall, Rose, Carte, 1859 — henceforth MDRA/year); online at “Concertina Library: Digital Reference Collection for Concertinas,” http://www.concertina.com/pricelists/wheatstone-english/Wheatstone-MDRA-1859.pdf. The ledgers are housed in the (Neil) Wayne Collection, The Horniman Museum, London. Thanks to the museum’s foresight and to the generous effort of Robert Gaskins, they are available in digital form at http://www.horniman.info. There is a gap in the coverage from 5 April 1848 through 31 December 1850 (an entire ledger is obviously missing), while the entries from 4 April 1835 to 4 April 1839 are patchy and likely incomplete. On the ledgers, see Atlas, “Ladies in the Wheatstone Ledgers: The Gendered Concertina in Victorian England, 1835-1870,” Royal Musical Association Research Chronicle, 39 (2006), 39-41, 58-66; online at “Concertina Library,” http://www.concertina.com/atlas/ladies/index.htm; Stephen Chambers, “Some Notes on Lachenal Concertina Production and Serial Numbers,” Papers of the International Concertina Association (hereafter PICA), 1 (2004),14-16, n. 4; online at “Concertina Library,” http://www.concertina.com/chambers/lachenal-production/index.htm. In addition to the sales ledgers, there are two books that list the firm’s expenses (for labor and materials) for the periods January 1845 – August 1846 and January 1848 – June 1849, as well as one ledger that records the production of concertinas with serial numbers 18061 – 21353 (March 1866 – December 1891). On the firm of Lachenal, see especially Chambers, “Some Notes on Lachenal Concertina Production,” 3-23; and “Louis Lachenal: ‘Engineer and Concertina Manufacturer’ (Pt. I),” The Free-Reed Journal, 1 (1999), 7-18; online at “Concertina Library,” http://www.concertina.com/chambers/lachenal-part1/index.htm. 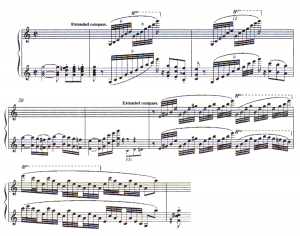 On the concerts, see Faye Debenham and Randall C. Merris, “Marie Lachenal: Concertinist,” PICA, 2 (2005), 1-17, online at “Concertina Library,” http://www.concertina.com/merris/marie-lachenal/index.htm; Merris, “Notes on the Lachenal Sisters, Richard Blagrove, Ellen Attwater, Linda Scates, and ‘Dickens’,” PICA, 7 (2005), 20-28; Robert Gaskins, “The Lachenal Sisters Visit Edinburgh, 1865-1866,” online at “Concertina Library,” http://www.concertina.com/gaskins/lachenal-sisters/index.htm. Published by Wheatstone in 1862. For an edition of the work, see Atlas, Victorian Music for the English Concertina. Recent Researches in the Music of the Nineteenth and Early Twentieth Centuries, 52 (Middleton, WI: A-R Editions, 2009), 134-44, with commentary on pp. xvi, 174. The portrait appears at “Concertina Library,” online at http://www.concertina.com/blagrove/richard-blagrove-portrait-debenham-and-gabell.htm. On the dates of the Debenham-Gabell partnership, see the database at “photoLondon,” online at http://www.photolondon.org.uk. The fifty-one entries include one undated transaction in ledger C104a for instrument #147; it is surrounded by entries from 1837. The publisher is so identified at the foot of the title page, where the address is given as 201 Regent Street (see below, §c). The British Museum date stamp — “1 AP 64” — appears on the final page (p. 38), and shows that a copy of the method book had been deposited by then. Being unaccustomed to two-letter abbreviations for the names of the months, I was befuddled by “AP” (I thought it signaled some arcane aspect of the copyright process). 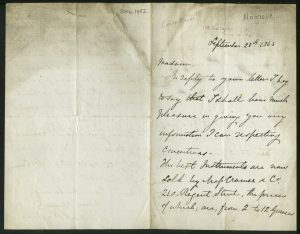 Thankfully, SOS-like queries to Nicholas Temperley and Christina Bashford — two of our foremost scholars in the field of Victorian music studies — brought forth same-day responses that added to “AP” the letters RIL. Thus the Instruction Book was published and deposited at the British Museum prior by 1 April 1864 at the latest. My thanks to both Nicholas and Christina (the latter of whom wrote the article “Blagrove. English Family of Musicians,” in New Grove, vol. 3, 670-71; online at www.oxfordmusiconline.com/subscriber/article/grovemusic/03199). Yet the combination of the April 1864 deposit date and the identification of the publisher as “Cramer, Wood & Co.” raises a problem in connection with Table 1, since Parkinson dates that particular combination of partners only from 1871 – 1872. Once again I dispatched SOS’s, this time to Leanne Langley and Christine Kyprianides, both experts in the area of Victorian music publishing (and music journals). The short answer is this: upon the death of Frederick Beale on 26 June 1863, the firm experienced a period of confusion and restructuring, during which it did, in fact, operate briefly under the name Cramer, Wood & Co.; and it was during that period that Blagrove’s Instruction Book was published. A guinea was equal to twenty-one shillings, that is, one pound plus one shilling. “Joseph Scates, the Original Manufacturer of Concertinas,” in MDRA/1862; online at “Concertina Library,” http://www.concertina.com/pricelists/scates/Scates-MDRA-1862.pdf. As we can judge from ledger C1046 (pp. 24-32), the 48-button instrument had already become by far the most popular model by 1844. The 154 transactions that year break down as follows in terms of the number of buttons on each instrument (I round off the percentages to the nearest tenth of a percent): 48 buttons = 86 = 55.8%, 44 buttons = 35 = 22.7%, 32 buttons = 16 = 10.3%, 38 buttons = 8 = 5.1%, 36 buttons = 2 = 1.3%; there are three models for which there is only one transaction each; these refer to instruments with 40, 43, and 54 buttons; finally, three entries fail to list the number of buttons. Victorian music publications generally do not carry dates of publication. The above dates are derived from the British Library Integrated Catalogue, which, however, lists dates of accession (these generally — though not always — coinciding with dates of publication) . The catalogue is accessible online: http://www.theeuropeanlibrary.org. The title page reads: “N.B. : Orchestral accompaniment (M.S. [manuscript]) to the above solo (as performed by Mr. Henry Roe at the ‘World’s Peace Jubilee,’ Boston, America; also at the Court-Gaiety-Globe Theatres, London; and Provincial Concerts &c) can be had by application to 20, Conduit Street, Regent Street, London, W.” (that is, at Wheatstone’s shop). 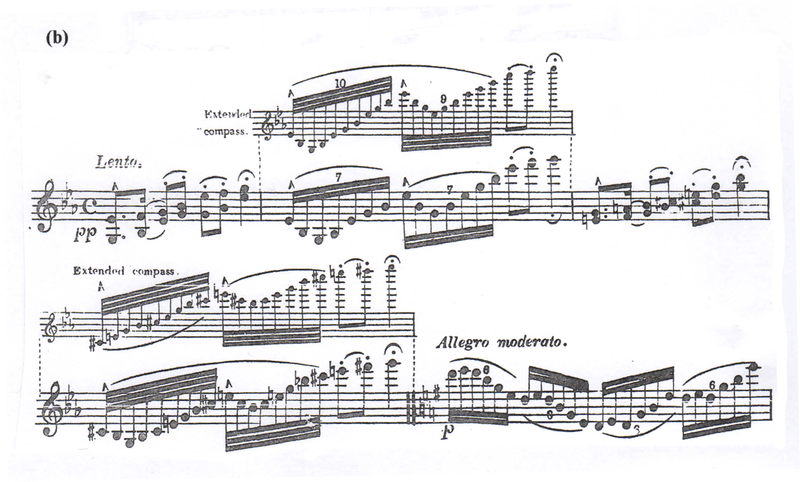 In “The Victorian Concertina: Some Issues Relating to Performance,” Nineteenth-Century Music Review, 3/2 (2006), 56; online at “Concertina Library,” http://www.concertina.com/atlas/victorian-concertina-performance/index.htm. 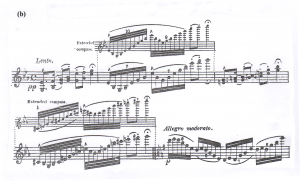 The report appears in a belated notice signed “F.W.M.” and headed “Aus Dresden” in the Neue Zeitschrift für Musik, xxvi/20 (8 March 1847), 80-81; the pertinent passage reads: “sogennanten Concertina [ . . . ] im Tone von g bis g’’’’ (the so-called Concertina [ . . . ] a range from g to g’’’’); the notice is printed in Helmut C. Jacobs, Der junge Gitarren- und Concertinavirtuose Giulio Regondi: Eine kritische Dokumentation seiner Konzertreise durch Europa 1840 und 1841 (Bochum: Augemus, 2001), 245, Doc. 117. Another review of the same concert makes it clear that Regondi also performed on a 48-button concertina; signed “Dr. J.S.” in the Allgemeine Musikalische Zeitung, xlviii/50 (16 December 1846), 853-54; reproduced in Jacobs, 242 , Doc. 115. See Great Exhibition of the Works of Industry of all Nations, 1851. Official Description and Illustrated Catalogue (London: Commissioners of the Great Exhibition, 1851), 469-70; Peter and Ann Mactaggart, eds., Musical Instruments in the 1851 Exhibition (Welwyn, Herts: Mac & Me, 1986), 60. See the entries for April – June and October – December 1871 (pp. 158-59 in the digitized version; there are no entries at all for the period July – September ) in the “production book” catalogued as C1054 in the series of Wheatstone ledgers preserved in the Wayne Collection at the Horniman Museum (see above, note 8). As my friend Randy Merris has informed me (in an email of 29 August 2017), Lachenal was also turning out 56-button instruments at the time. According to Merris, the earliest Lachenal serial number with fifty-six buttons is no. 12362, which Merris dates from the mid-1460s. Online at http://www.concertinamuseum.com/CM00269i.htm, from which the following descriptions are taken. Perhaps concertina manufacturers recompensed concertina teachers who recommended buyers as matter of course; or did Blagrove enter into a such an agreement with Cramer & Co. because other manufacturers would not do business that way? See the discussion in Allan W. Atlas, “Ladies in the Wheatstone Ledgers,” 39-41. See Atlas, “Ladies in the Wheatstone Ledgers,” 29, 172.